Use cattle wise, it's Allan's message. Many cattle graze intensively in larger herds but a short time in each place. This leaves trampled plants and much feces. the area recover itself and grows until it is time for the next round of cattle. As the picture shows. 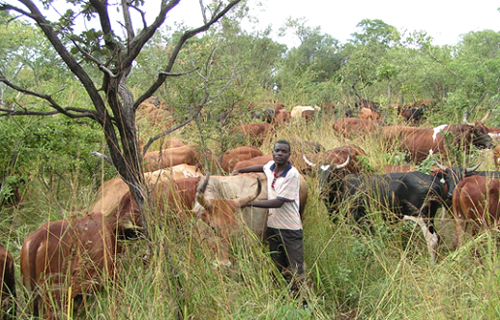 The world can therefore get more meat, but not from meat factories but from the large amount of pasture available particularly in Africa and America. But the world does not need more animal factories where lots of animals are in a confined space and where food is grown on farmland around it. It should be more free range meats in our shops. Our agricultural policies do not support this wholeheartedly. Farmers in Sweden are compensated for cutting the grass on fields that will only lay there to no avail. It would be better that farmers received better compensation for keeping animals in natural rangelands which would also lead to that more biodiversity would recover in our country. In addition to Allan and some more photos. 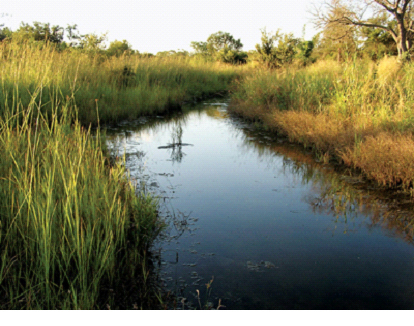 This river in Zimbabwe used to flow year-round. 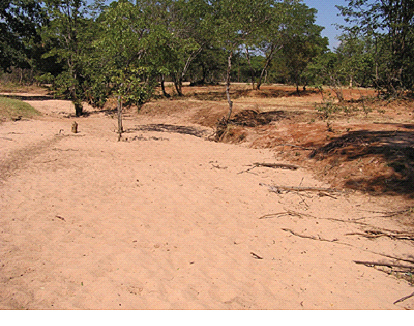 Then overgrazing by wandering livestock bared much of the soil in the surrounding area. Today the river flows only as flash floods following heavy rains. Biodiversity loss is severe, livestock are starving, and most wildlife has disappeared. This shot of a nearby river was taken on the same day. It used to have similar problems but now it always has water and flows most of the year. Drought is rare, biodiversity is increasing, and wildlife has reappeared in large numbers. Following Allan Savorys advice will not only result in better grasslands, more meat, but also more of the wildlife. In addition, the vegetation that comes back also affects the climate and dehydration decreases. It's a win-win situation. He writes about this land. At the outset, when we donated the ranch land, it had no elephant and buffalo at all (due to a veterinary fence, since removed), and a sparse, fluctuating population of other game. While the communal land still supports little wildlife, the situation on the ranch is very different today. The ranch now supports significant and increasing numbers of elephants, buffalo, kudu, sable antelope, waterbuck, zebra, impala, giraffe, reedbuck and many other diurnal and nocturnal animals. Widely ranging elephants can on some days number 300 or more and, likewise, buffalo herds from 500 to 1,000.